Papers marked as “Confidential” have popped into the limelight today as part of court papers submitted by Google. 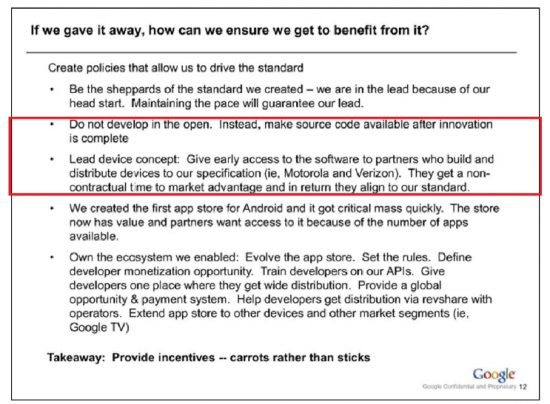 It seems to reveal that companies who adhere to the Google specs are able to put phones and tablets on sale first. Do not develop in the open. Instead, make source code available after innovation is compete. A “lead device” concept is also mentioned, which seems to suggest that certain handsets launch with the newer version of the OS provided they tick all the Google boxes. There’s still a worry that Google will give preferential treatment to certain manufacturers, especially Motorlola, who they recently purchased.